Blue Monkeys No. 41 is a painting by Steve Bogdanoff which was uploaded on January 20th, 2013. The Aegean island of Thera, which is now known as Santorini, contained a Bronze Age settlement called Akrotiri. In 1500 B.C., the settlement was destroyed by an immense volcano eruption. In the early 1900s, archaeologists discovered the buried settlement and digging ensued. They uncovered a palace room, which they later tagged as Room B6 (shrine) of sector B. Much of the remnants found in the shrine portray a family of blue monkeys climbing on the rocks of the island's volcano. Also found at the site was a portion of a wall-painting with what appears to be the head of a dog. 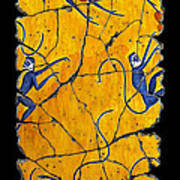 It is believed that the scene depicts the canine chasing the group of fleeing monkeys. 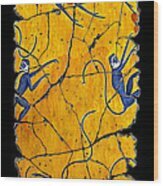 The monkey theme is popular in frescoes throughout Crete and on Thera. It is believed that the monkey motif originated in Crete and was later incorporated in art found at Akrotiri. Artists from both locales used blue coloring to represent the monkey's coat and skin. The monkeys almost have a human-like quality. It is understood that the monkeys were looked upon by the Minoans and the inhabitants of Thera as sacred animals and servants to the gods. 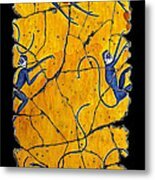 Bogdanoff's blue, red and green monkey frescoes are inspired by these fascinating ancient images. In creating his compositions, he incorporates movements used in ballet and interpretive dance to project fluidity and grace through the monkeys' torsos, arms and legs. His tails are designed to convey the monkeys' actions and moods. He works in abstract shapes and designs to enhance the scene and interact with the monkeys. His backgrounds have a subtle shift in color midway between the top and bottom, to give the impression of landscape and sky or, in some instances, the illusion of dusk. Bogdanoff's goal is to provide the viewer with an animal unlike any seen in captivity or imagined by anthropologists or zoologists, neither primate nor human, evoking a presence that is mysterious, sensuous and timeless. There are no comments for Blue Monkeys No. 41. Click here to post the first comment.